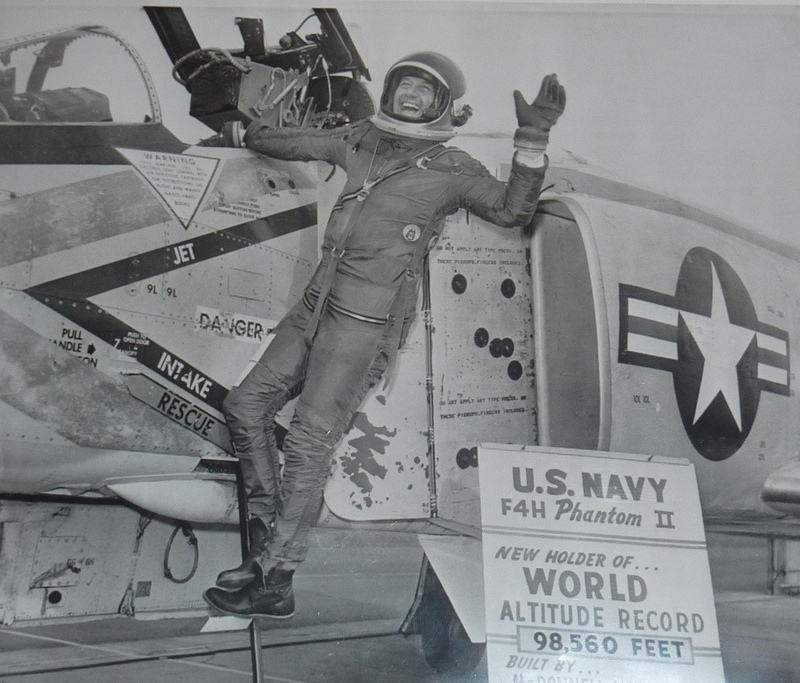 5 December 1961: Commander George William Ellis, United States Navy, established a Fédération Aéronautique Internationale (FAI) World Record for Altitude in Horizontal Flight when he flew the McDonnell YF4H-1 Phantom II, Bu. No. 142260, to 20,252 meters (66,444 feet) ¹ over Edwards Air Force Base, in the high desert of southern California. 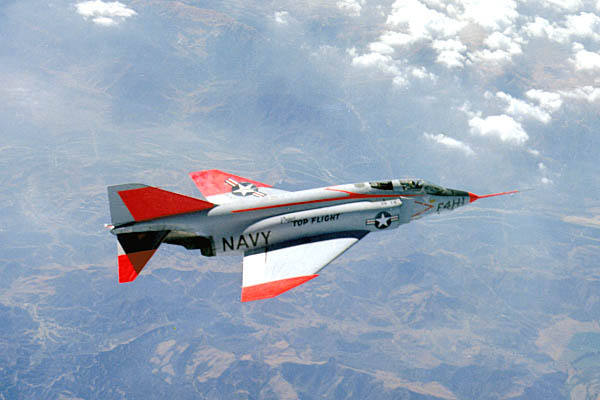 The Phantom II maintained this altitude while traveling at Mach 2.2 (1,452 miles per hour, or 2,236 kilometers per hour). 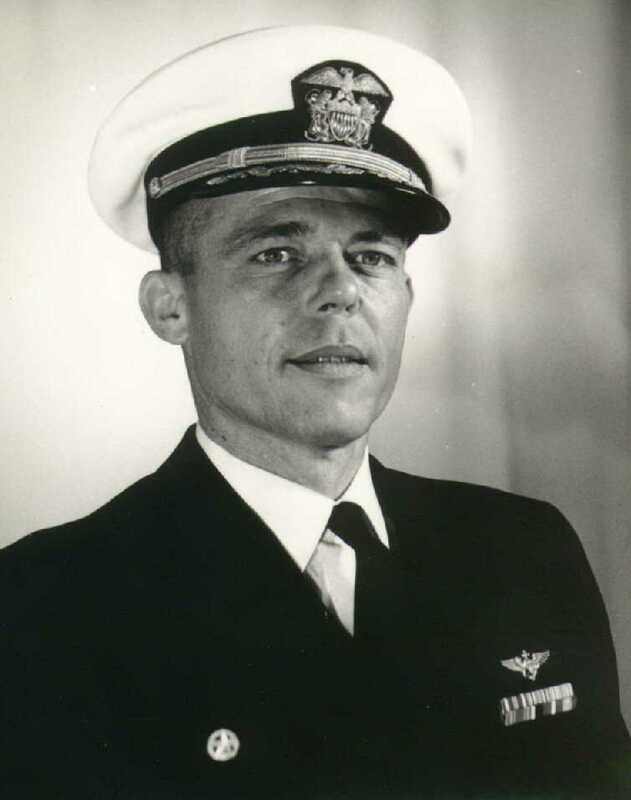 For this flight, Commander Ellis was awarded the Distinguished Flying Cross by Admiral George Whelen Anderson, Jr., Chief of Naval Operations. McDonnell YF4H-1 Bu. No. 142260 was the second prototype of the Phantom II. The world record-holding aircraft is reported to be in storage at the San Diego Air and Space Museum’s Gillespie Field Annex restoration facility, El Cajon, California. George William Ellis was born at Ardmore, Oklahoma, 22 June 1924. He was the second of three children of Fred Roscoe Ellis, a corporate attorney, and Jeannette Manning Moore Ellis. 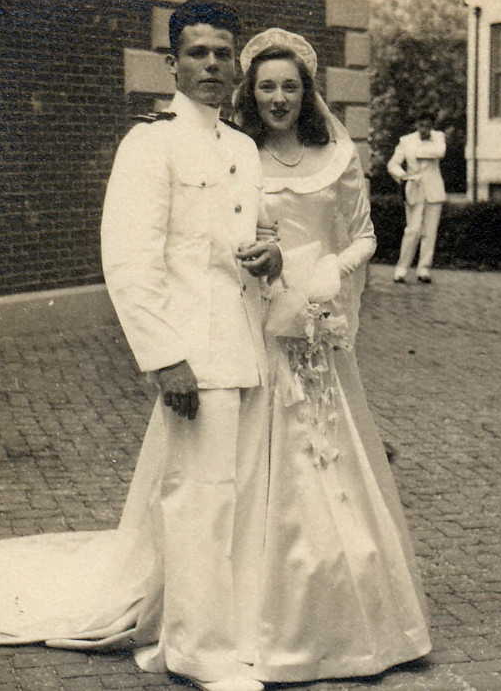 On the same day, Ensign Ellis married Miss Elizabeth Adelheid Schlack at Annapolis. They had one son, John Manning Ellis, who died in infancy. They divorced in 1970. Mrs. Ellis died in 1985. Ensign and Mrs. George W. Ellis, 6 June 1945. 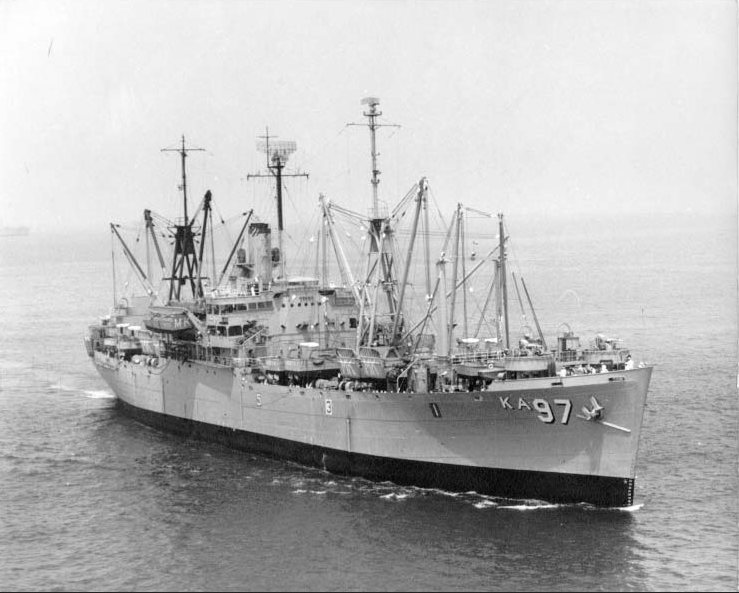 Ensign Ellis served aboard USS Bataan (CVL-29), an Independence-class light aircraft carrier, which was part of Operation Magic Carpet, returning American soldiers home from Europe after the end of World War II, and then repatriating Italian prisoners of war from the United States to Italy. Ellis was then assigned to USS Duluth (CL-87), a Cleveland-class light cruiser, on a cruise to the Far East. Ensign Ellis was promoted to the rank lieutenant, junior grade, effective 6 June 1948. He was trained as a pilot, and was designated as a Naval Aviator in January 1949. He was assigned to Anti-Submarine Squadron 22 (VS-22, “Checkmates”) at NAS Norfolk, Virginia, flying the TBF/TBM Avenger. 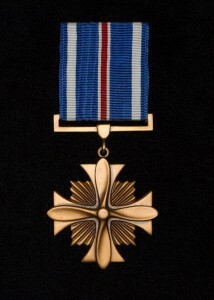 Lieutenant (j.g.) Ellis also was assigned to the staff of a carrier division commander, and the went the Advanced Training Command as a flight instructor. Ellis was promoted to lieutenant, 1 August 1951. 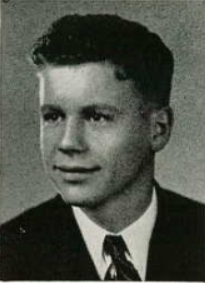 He attended the Naval War College at Newport, Rhode Island, 1954–55. His next operational assignment was to VF-211 (“Checkmates”) aboard USS Bon Homme Richard (CV-31). The fighter squadron was transitioning from the North American Aviation FJ-3 Fury to the Chance Vought F8U-1 Crusader. 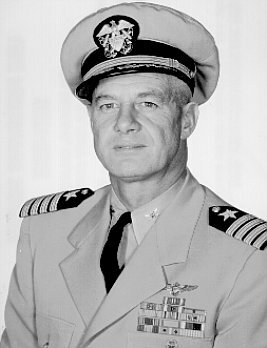 Ellis was promoted to lieutenant commander, 1 June 1957. 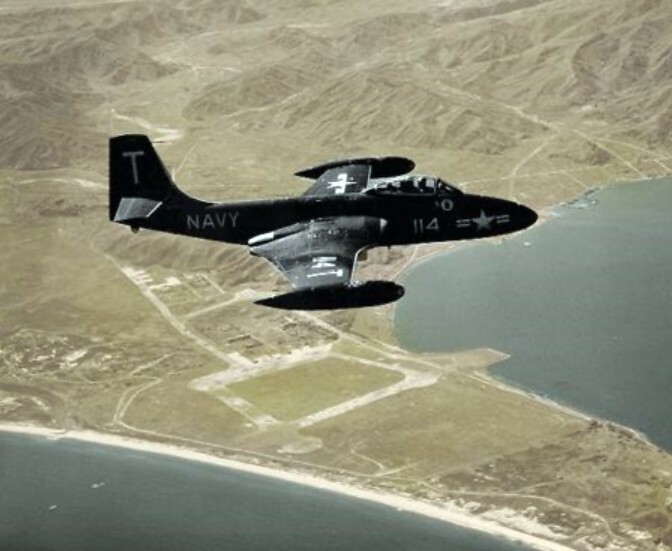 He was assigned to VF-124 (“Gunfighters”) at NAS Moffett Field, California, as an instructor and maintenance officer for the F8U. In June 1959, Lieutenant Commander Ellis attended the United States Naval Test Pilot School at NAS Patuxent River, Maryland. 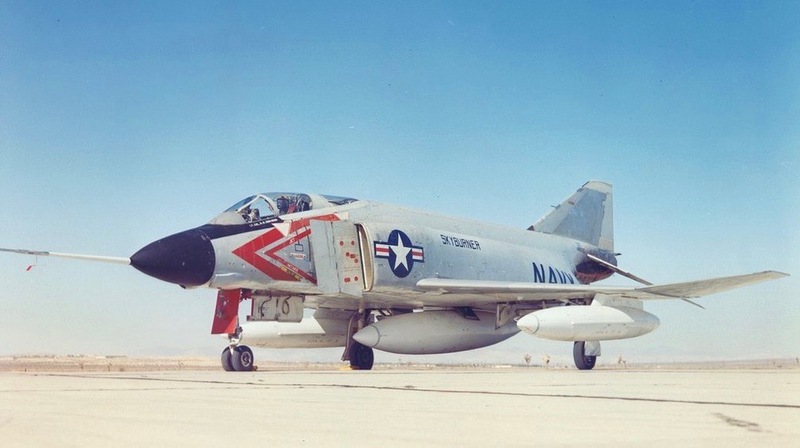 After graduating, he was assigned as project pilot on the new McDonnell F4H-1 Phantom II. He was promoted to Commander with date of rank 1 July 1961. 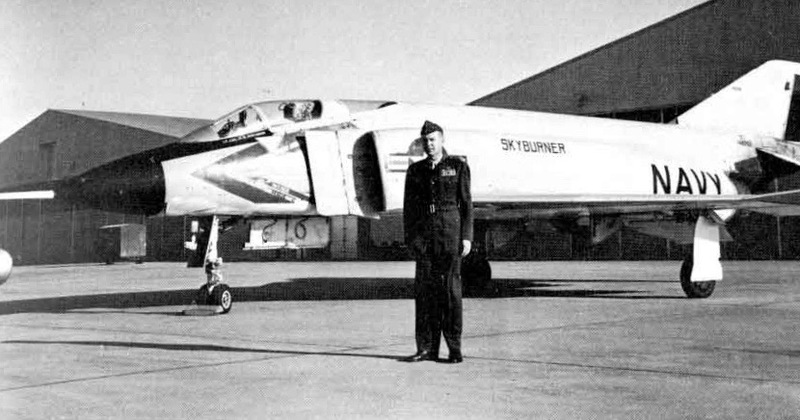 In August 1962, Commander Ellis was assigned as executive officer of Fighter Squadron 74 (VF-74, “Be-Devilers”) aboard USS Forrestal (CVA-59), for the first operational deployment of the Phantom II (the F4H-1 was redesignated F-4B in 1962). 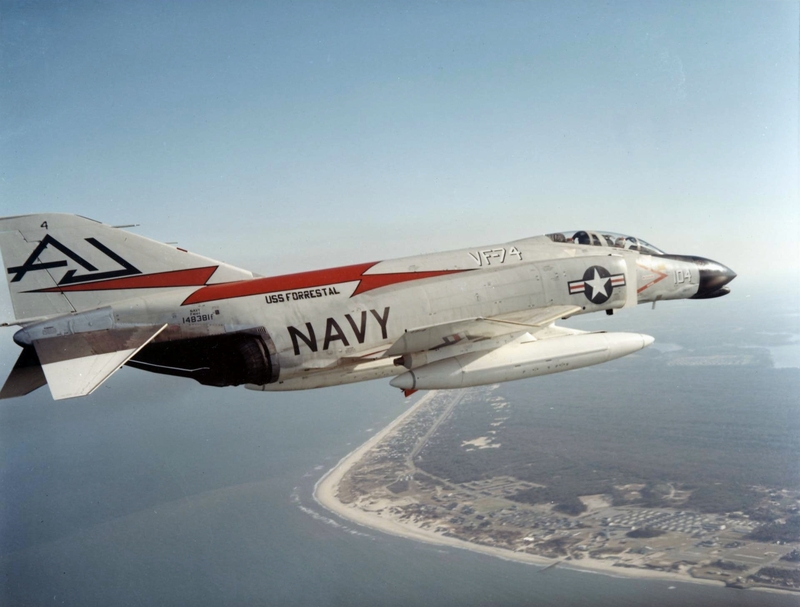 He took command of VF-211 in May 1963, then in May 1964, took over VF-101 (“Grim Reapers”) at NAS Key West, Florida. In 1965, Commander Ellis served as the Operations Officer of USS Forrestal, and became the aircraft carrier’s executive officer in 1966. Ellis was promoted to the rank of Captain, 1 October 1966. He was then assigned to the staff of the Chief of Naval Operations, Admiral Thomas Hinman Moorer. 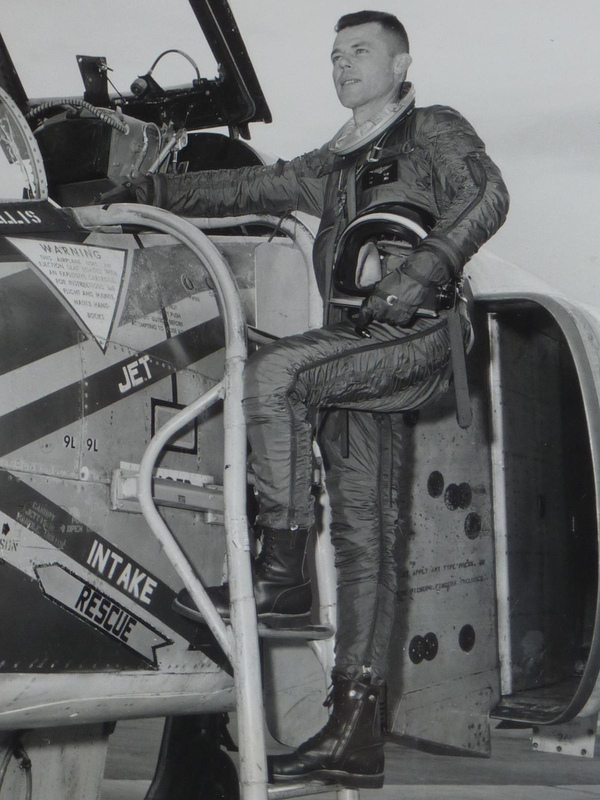 After his tour at the Pentagon, Captain Ellis went to the Naval Air Systems Command (NAVAIR) at NAS Patuxent River as project manager for the F-8 Crusader Service Life Extension Program. After assignment as the head of the Fleet Operations Branch in the Office of the Chief of Naval Operations, Captain Ellis retired from the Navy in 28 February 1973 after 31 years of service. On 30 November 1974, Captain Ellis married Mrs. Barbara Young Clayton at Fort Myer, Virginia. Captain Ellis died at Harrisonburg, Virginia, 6 July 2010, at the age of 86 years. 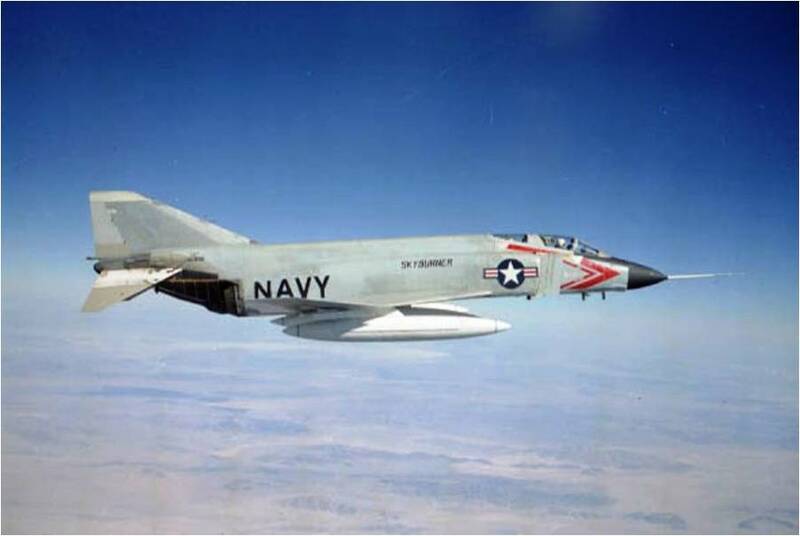 22 November 1961: In recognition of the 50th Anniversary of Naval Aviation, a number of speed and altitude record attempts were planned, using the U.S. Navy’s new McDonnell YF4H-1 Phantom II fighter. 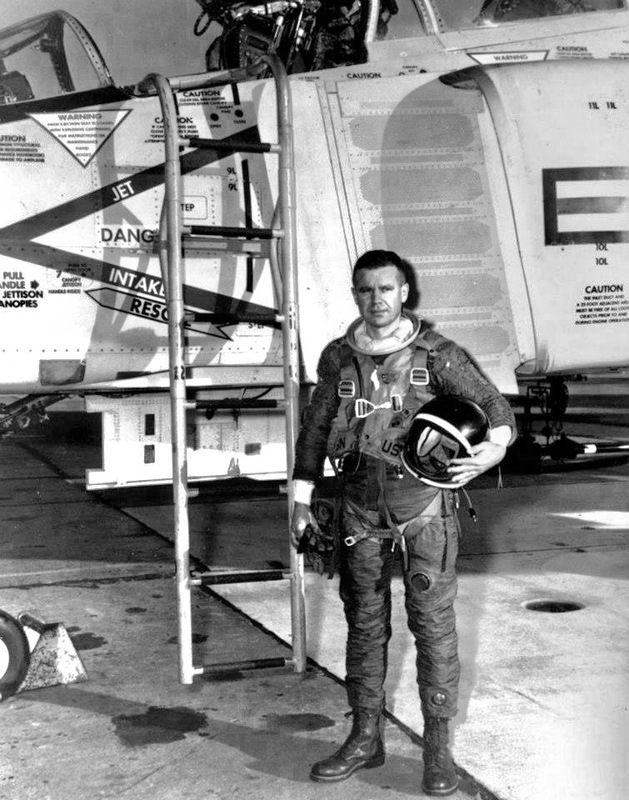 On the morning of 22 November, Lieutenant Colonel Robert Bradford Robinson, Jr., United States Marine Corps, took off from Edwards Air Force Base on Operation Skyburner, an attempt to set a new World Absolute Speed Record. He was flying the second Phantom II built, Bu. No. 142260. The Phantom carried three external fuel tanks for this flight. It had a 600-gallon (2,271.25 liter) centerline tank and two 370-gallon (1,400.6 liter) wing tanks. Robinson flew southeast toward NAS El Centro, then turned back to the northwest. 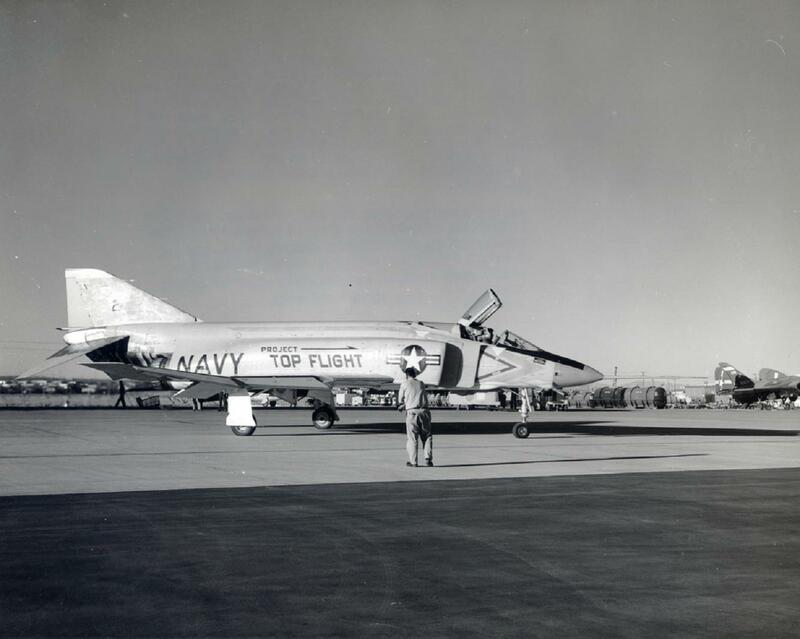 Over the Salton Sea, he began to accelerate the YF4H-1 to build up speed for the record run over a measured twenty-mile course back at Edwards AFB. The Phantom’s two General Electric J79-GE-3A afterburning turbojets used a tremendous amount of fuel at full throttle and the centerline fuel tank was quickly emptied. Robinson jettisoned the empty tank over the Chocolate Mountain gunnery range. Continuing to accelerate, the two wing tanks were next jettisoned as they ran dry, this time at Bristol Dry Lake. The Phantom entered the east end of the speed course in full afterburner. Having burned off more than 1,300 gallons of fuel, 142260 was much lighter now, and aerodynamically cleaner after dropping the external tanks. Robinson exited the west end of the 20-mile (32.2 kilometer) course in less than one minute. Fédération Aéronautique Internationale rules require that a speed record must be made with two passes in opposite directions. The average speed of the two runs is the record speed. 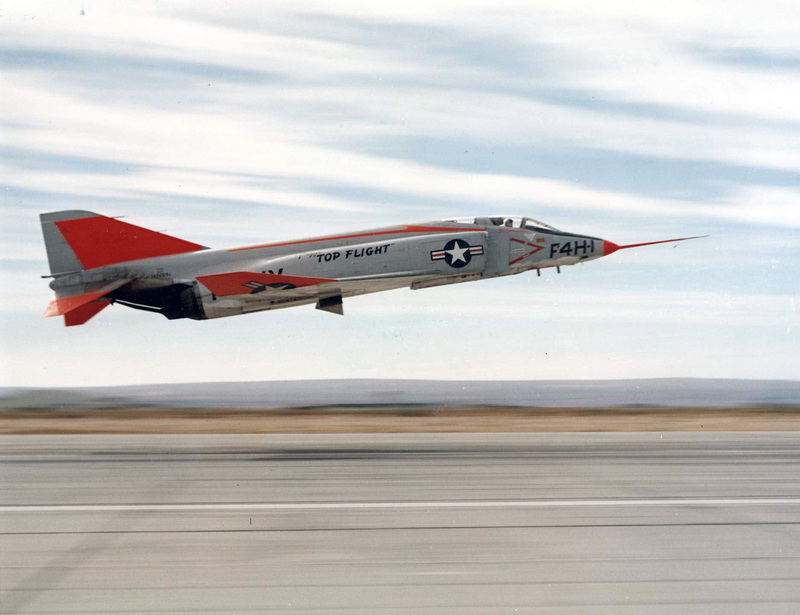 The Phantom was flying so fast that it covered another 105 miles (169 kilometers) before it could turn around. During the turn, it was still traveling at 0.9 Mach. For his accomplishment, Lieutenant Colonel Robinson was awarded the Distinguished Flying Cross by Secretary of the Navy John B. Connally. The presentation took place on 25 November 1961 at Newport News, Virginia, during the commissioning of USS Enterprise CVA(N)-65. Robert Bradford Robinson, Jr., was born at Orange, California, 22 October 1923. 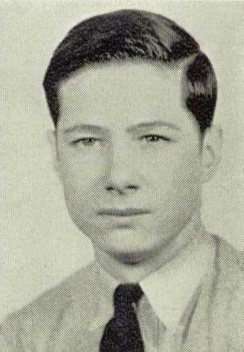 He was the second of four children of Robert Bradford Robinson, a U.S. Postal Service mail carrier, and Golda Leutha Nordeen Robinson. 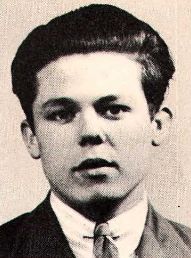 Bob Robinson attended Orange Union High School, graduating in 1941. He participated in all varsity sports, and was selected to attend the Boys’ State leadership program. He earned a bachelor of science degree at Washington University, St. Louis, Missouri. 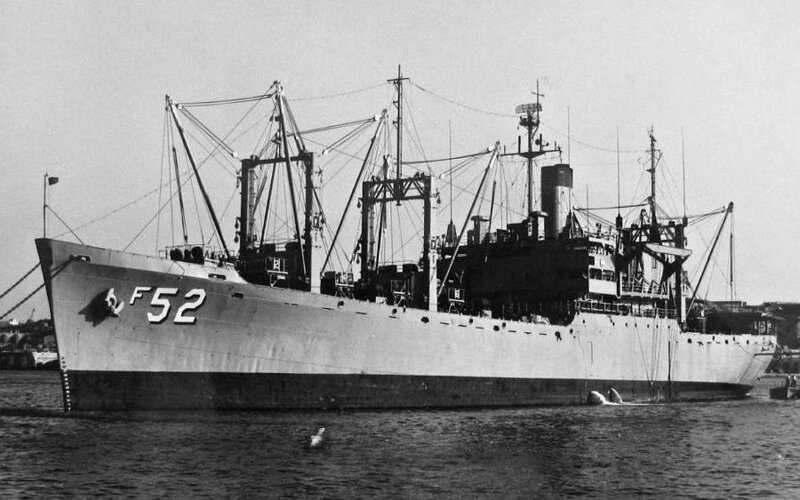 Robinson entered the United States Marine Corps on 26 August 1942. He received the wings of a Naval Aviator and was commissioned as a second lieutenant on 1 December 1943. 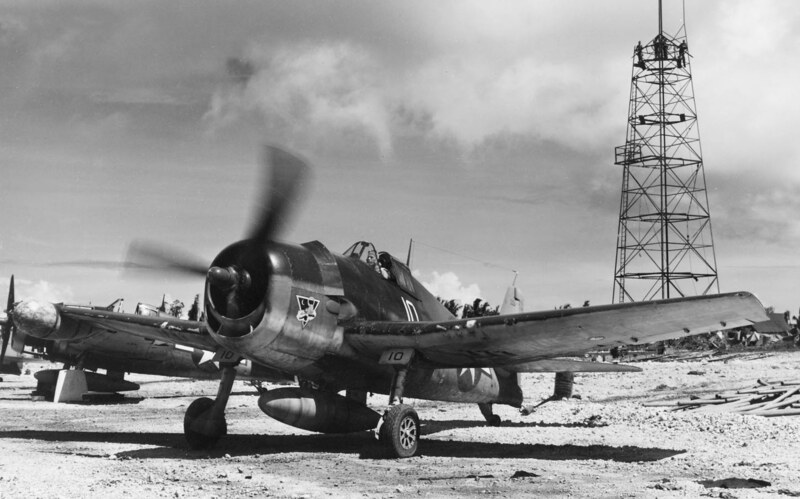 During the Battle of Okinawa, Lieutenant Robinson flew the radar-equipped Grumman F6F-3N Hellcat night fighter with VMF(N)-543. Lieutenant Robinson was promoted to the rank of first lieutenant, 31 March 1945. Following World War II, Lieutenant Robinson was assigned to VMF-311, and became one of the first Naval Aviators to qualify in turbojet-powered aircraft. 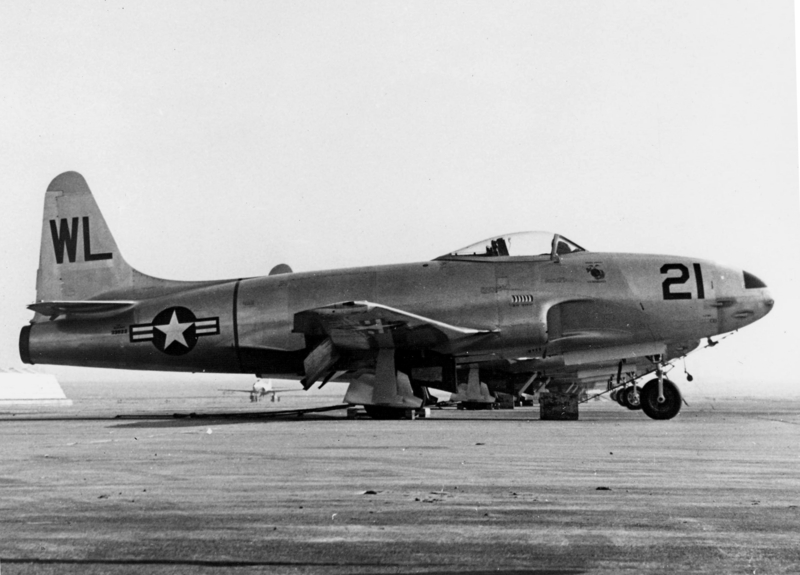 The squadron initially flew the Lockheed TO-1 Shooting Star (P-80), and later transitioned to the Grumman F9F Panther. Lieutenant Robinson was promoted to the rank of captain 1 April 1950. 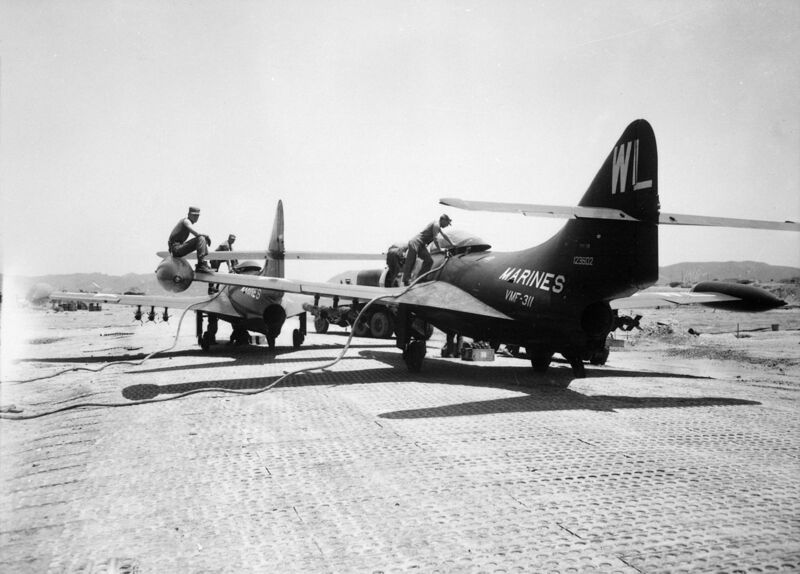 VMF-311 was sent to the Korean war zone in November 1950, initially operating from Yokosuka Air Base in Japan. The squadron flew close air support missions in support of the amphibious assault of Inchon, and at the Battle of the Chosin Reservoir. Captain Robinson returned to night fighter operations when he joined Marine All-Weather Squadron 513 (VMF(N)-513) on 13 January 1951. 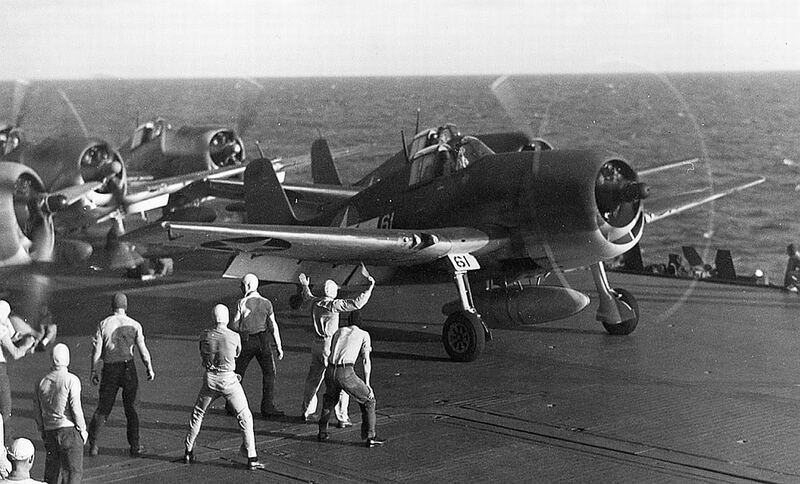 The unit which was equipped with Grumman F7F-3N Tigercats and Chance Vought F4U-5N Corsairs. Captain Robinson was promoted to the rank of major, 31 December 1954. He completed the six-month course at the Naval Test Pilot School, NAS Patuxent River, Maryland, graduating in March 1959 (Class 21). In 1963, lieutenant Colonel Robinson retired from the Marine Corps after 20 years’ service. He was then employed as a test pilot for the McDonnell Aircraft Corporation at St. Louis, Missouri. He remained with the company for 30 years. Mrs. Robinson died 7 February 1997, after 53 years of marriage. Bob Robinson later married Mrs. Julian Brady (née Elizabeth Catchings), the widow of a long-time friend. Robert Bradford Robinson, Jr., died 28 September 2005 at McComb, Mississippi. He was buried at the Hollywood Cemetery in McComb.